With more than 800 million active users (more than half of whom logon every day), it is no wonder so many people have written about Facebook. Some have looked at how political candidates use Facebook, other, rhetorically-minded scholars have seen it as a pedagogical aid. Oddly, however, Facebook has not received an adequate analysis as a unique, multimodal, rhetorical space. This is due, in large part, to a lack of analytical tools for such a diverse medium. A quick glance at the scholarship shows that some have done genre analyses while others have used traditional content analysis rubrics – but those are inadequate methods of analysis given the complexity of such a space. Similarly, traditional visual rhetoric tools would certainly shed light on particular aspects of Facebook but would also be left wanting in the face of so much data. And if Facebook hasn’t received adequate analysis, Google’s recent launch into the social media world has received even less (considering it is about six years younger). Google+ has attracted few users relative to Facebook (around 40 million), but its initial rise to 25 million users happened 20 times faster than any other social networking site to date. As the only contender to Facebook with similar features, and as a new, unanalyzed space, it deserves critical attention. For the purposes of this essay I subject Facebook and Google+ to a rhetorical analysis that goes beyond a mere visual examination since there are more complex components that comprise these sites than just images and/or layout. To that end I will be employing Melinda Turnley’s mediological method as it finds expression in her sevenfold evaluative rubric. After briefly introducing mediology I work through each of Turnley’s seven “Dimensions of a Medium” in turn: first introducing the concepts as she articulates them and then applying them in a comparative analysis to Facebook and Google+. This essay serves two purposes: not only to analyze two popular social media sites, but also to demonstrate the strength of and need for a multimodal evaluative tool in the digital age. In the mid 90s, French theorist Régis Debray developed mediology as a method of analyzing culturally transmitted data that was expressed through different mediums (e.g., text, images, audio, etc.). Recently this method has been further developed by Melinda Turnley who recognized its potential for the modern composition classroom. The modern student, she observes, uses multiple modes to communicate with and participate in society – and these modes go beyond the traditional “non-visual” mediums of oral or text-based communication. Increasingly, students’ primary outlet of composition happens online (or at least digitally) and can take verbal or visual form. One scholar has suggested that it would be better to approach “digital communication as a mixed modality that combines elements of communication practices in embodied conversations and in writing.” Accordingly, mediology borrows from a number of rhetorical methods including the same semiotically-oriented approach to images as Gunther Kress and Theo Van Leeuwen and, therefore, provides a means to evaluate these multimodal compositions. Turnley suggests that mediology is the best method for analyzing the complex interplay of various modes in the digital age and provides seven categories of evaluation. What follows is an introduction to the theory behind each of the dimensions as well as a critical application of Turnley’s rubric. Turnley points out that every “medium has a technological dimension that is necessary to its functioning.” While this may seem more obvious within an analysis of Facebook and Google+ which are both digitally mediated (through phones, tablets, and computers), she reminds her readers that technology is bound to a medium as ostensibly simple as text as well (e.g., moveable type, book/pamphlet binding, etc.). Turnley makes two important points that distinguishes her approach from other, deterministic analyses of digital media. First is that “certain technologies may support certain structures and practices, but technological forms do not wholly determine media’s uses.” This claim could function as an explicit counterpoint to someone like Neil Postman who suggested that visual mediums were inherently entertainment-oriented, and so much so that even serious conversations that could take place in the news had to be structured and presented in ways that were (at least) stylistically entertaining. Her second, related point not only distances her approach from deterministic ones, but restates the larger scope of mediology: “Deterministic narratives often reduce media to their technical components. Thus, to encourage students to be critical producers and consumers of media, I seek to complicate these reductive framings by situating work with media in relation to not only technological aspects but also the other six dimensions of the framework.” In other words, if I were to follow a more deterministic rubric for evaluating these sites the discussion would happen exclusively within this category with no consideration for other influential factors. Having introduced Turnley’s formulation of the technological dimensions of a medium, as well as having pointed out its limitations if separated from the rest of her framework, I now turn to specific, technological considerations of Facebook and Google+. There are some obvious, requisite technologies that Google+ and Facebook rely on: internet connectivity, a digital device capable of supporting either an app (e.g., smartphones or tablets) or the internet versions of each site (e.g., computers or standard phones with internet connectivity but no app support). While neither site launched in the early days of dial-up internet, the technology was present and other social media predecessors took advantage of the popularization of the internet and the cultural desire for online community formation. Most scholars look back to 1997 for the first social media site: SixDegrees.com. But it is important to note that the individual components that make up a social media site existed separately across various web services prior to SixDegrees’s inception. The earliest components were simply the ability to alter profiles (which existed on various dating services) and list Friends (which was available, most popularly, in AOL Instant Messenger). A year later SixDegrees added the ability to search others’ Friends Lists. In contemporary manifestations of social media sites (including Google+ and Facebook), those technological components along with the ability to send or post private and public messages, upload photos and videos, and traverse extended networks of profiles are essential characteristics, and where the sites differ is often in the mechanics of these technologies. On this technological level, very few differences exist between Google+ and Facebook. Both support hosted modules or applications and both allow access to any singular component (e.g., profiles, Friend lists, messages, etc.) from the homepage. A significant difference between the two lies in Google’s development of various, seemingly unrelated technologies and their subsequent incorporation of those technologies into its social media site. From the Google+ homepage, the user can access all of the services offered in the Google Suite (e.g., Gmail, Google Docs, Blogger, Google News, etc.) and on the right side of the homepage there is a native, ever-present YouTube link that remains in the same position as you scroll down the page. While Facebook supports embedded YouTube videos, they suffer from Google’s ownership of YouTube and development of several other tools. While Facebook allows private messages to be sent between users, Google+ uses its well-developed email application to send, receive, and archive private messages which also allows contacts who don’t use Google+ (or Gmail) to be included in your public messages. For people who use any part of the Google suite, Google+ nicely ties all of its components together suggesting a connectedness between all aspects of one’s life. Calendars, photo albums, documents, and videos are all accessible within a networked community. Presumably these tools have some crossover with the various communities present in Google+. If family members want to schedule an outing they can share dates through Google calendar, while classmates can share study guides through Google Docs, and an entertaining YouTube vides is just a mouse-hover away. While this appears as a great strength within Google+, it assumes a great deal of familiarity with the Google Suite – a digital literacy that many younger users likely haven’t developed. Facebook and Google+ have developed their tools in opposite directions. Facebook invited members to join communities and steadily built in tools like private messaging, note sharing (the closest thing to Google Docs Facebook offers), and video embedding. 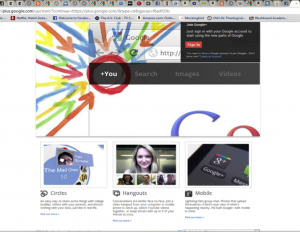 Google+ is the latest addition to the Google Suite and serves as a skin to the rest of the tools that Google offers. Unsurprisingly, therefore, the majority of Google+ users are white, American males in either educational (e.g., teachers, administrators, or graduate students) or technological vocations. Facebook, on the other hand, is far less polarizing and its users are split evenly across almost all demographics surveyed. These demographics aren’t surprising given the culture from which each site sprung. While Facebook emerged from school communities before being open to anyone over the age of 13, Google+ was only open to a select (technologically fluent) few during its beta stages, and those select few were given invitations to invite their friends (presumably similarly inclined users) before it became public. Two very different cultures helped shape each site’s technology and in the co-constructive universe of technology and culture, each site appears to be catering to those foundational cultures. So while one might be inclined to conclude that Facebook rules the social media world despite the wide variety of tools incorporated in Google+, it appears that that dominance might be, at least in part, due those tools and the digital literacies they require. Turnley describes the social aspects of mediums as the “metaphors, images, and narratives that circulate in relation to a medium… as well as patterns of individual and group association that develop vis-à-vis a medium.” She refers back to early imagery surrounding the popularization of the World Wide Web which pictured the web as “an inclusive global community – a worldwide network of limitless access, information, and possibilities.” This picture of the web encouraged participation in and further development of the internet as a symbol of democracy – a metaphor that still dominates optimistic perspectives of Web 2.0. No student of rhetoric would undervalue the power of a good metaphor (consider how hard we work to overcome the “argument is war” metaphor), but given that mediology goes beyond rhetoric proper and pulls from strains of semiotics and linguistics, it is important to remind the reader of the important work that George Lakoff and Mark Johnson, two cognitive linguists, did in the realm of “conceptual metaphors.” Long seen as mere literary devices (by everyone outside of rhetorical circles, no doubt), metaphors were ostensibly mere tools of communication that were used to convey meaning in interesting, and often poetic, ways. But metaphors permeated everyday speech and often shaped the way people understood abstract concepts (i.e., a person who embraces a “love is war” metaphor is going to think of love in different terms than a person who embraces a “love is a journey” metaphor). Lakoff and Johnson put this theory to the test and discovered that metaphors indeed changed not only the way people thought about and understood everyday concepts, but also how they acted in relationship to those concepts. It is because of this pervasive power of metaphors that it is included under the social rubric within mediology and, unsurprisingly, metaphors play a significant role within social media. While I am primarily concerned with a user’s experience with each site’s primary interface, it seems important to note a couple things about how Google+ and Facebook each represent themselves on their login screens; you will notice that there is strong carry over from the technological dimension. Not only is Google explicit about Google+ being just another tool in its suite (which is why it is merely something in addition to the Google experience) but, interestingly, Google+ seems to be keenly aware of their demographic. On their login page they advertise “circles” as “an easy way to share some things with college buddies, others with your parents, and almost nothing with your boss. Just like in real life.” So despite the variety of colors that make up the “You” of Google+, there are a lot of assumptions made here about the less-than-diverse users who might actually be interested in using the site. Facebook, on the other hand, relies less on text and more on branding with their trademarked color scheme and logo providing the primary visual aspects. Nevertheless, it is hard to miss that people are invited to join because “it’s free and always will be.” Facebook leads with its accessibility and availability – even on the go. The login screen advertises Facebook’s mobility and suggests that you can stay connected even if you are “heading out.” “Connected” here could carry both common meanings: to be connected in a digital sense (e.g., to an outlet, to a network, etc. ), or personally to another person/user – Undoubtedly Facebook’s purpose is to connect people personally through networked connections so there is some effective double entendre working here, but it is interesting how Facebook frames the nature of connections with this phrase. To “head out,” therefore without access to Facebook is to disconnect – digitally and personally. To put it in the most positive way: this kind of rhetoric reflects and solidifies cultural notions of connectedness and interpersonal relationships. Once logged in, both sites operate within a context of metaphors. Google+’s landing page is called the Stream (in which you can create “ripples” with popular posts that others share), while Facebook’s is called the “News Feed.” Facebook’s metaphor is particularly interesting when you consider that, by design, Facebook shares a variety of activities from people in your network (e.g., any status update, music listened to on various apps, relationship changes, “likes,” etc.). All of these are listed under the metaphorical category of “news.” Since metaphors have the power to shape understanding, I wonder what happens when information, important and unimportant alike, get put under the larger banner of “news.” It would seem to follow that either unimportant news’s value gets elevated, or actual news gets devalued (or even trivialized). Google+ only shares information in its “Stream” that Friends actually post – which functionally weeds out any information that is overtly trivial. The biggest distinguishing feature of Google+ within the social dimension is how Friends are added to a user’s network. In Facebook, you add a Friend (and they “confirm” you as a Friend) and if you choose to, you can make “Lists” with certain Friends so that you only see their updates. With Google+, you add Friends to one or more circles (e.g., Close Friends, Family, Co-workers, Band mates, etc.). In order for you to add a Friend in Google+ they must be added to a circle; every Friend is connected to you (and whoever else runs in those circles) in some way. Circles can overlap and never end – two characteristics not shared with lists. The circle metaphor more realistically captures off-line relationships and the networks people belong to. There is obvious overlap with the social dimension of a medium here, but consider how television has been understood as a medium. When I was young it was the place where my dad could get news quickly in the morning before work, relax in front of after work, and where the whole family could come together and enjoy our favorite primetime shows. We kept our television (and moved all of our furniture around it) not because of its intrinsic value (otherwise we’d stare at our cars after dinner), but because of the social value it had in our family. Every successful medium has economic components to it – both technically and socially. This economic aspect to mediums complicates issues further with respect to different cultures and accessibility. Building social value requires appealing to culturally-constructed ideals that are not necessarily (or likely!) global. This does not necessarily mean that some mediums are going to be favored more in different cultures because of different cultural values (though it’s possible), but that mediums will find more relevant expressions as they are shaped by the cultures that surround them. Additionally, the economic dimension of mediums also influences access. Simply put, not everyone can afford computers and internet access, much less smartphones and internet tablets. Access to mediums has always had a strong economic component to it: not everyone was trained to appreciate the rhetoric of antiquity (and not everyone held an office where they could readily hear it), relatively few people prior to the Reformation could read and the invention of the printing press may have increased production of texts but it also introduced more commercial concerns that we live with today. Digital literacy assumes access that isn’t always available in reality – at least not in equal measures. These are all critical questions that are rightly asked of social media. Amidst the already busy interface of Facebook’s landing page, a relatively large column (the second biggest on the page) is devoted entirely to sponsored advertisements. Additionally, above that is a “Sponsored Story,” which tells me that two of my Friends “like” Amazon.com – a more personalized advertisement than “Bloodiest FB Game Ever!” which happens to be the first advertisement below it. Each of these advertisements require a Facebook-mediated interaction (typically a “like” or an app installation), for which the user is rewarded (with a badge, or page access, group membership, etc.). In this way there becomes a kind of economy within Facebook where people collect badges, get high scores, or exclusive access to a page or commodity. This is one way in which Facebook creates value and keeps people signing up and coming back. This is one example of what Devin Friedman calls the “Achievement aspect” of social media sites. Most basically there is an implicit economy of Friends where users are encouraged to get as many Friends as possible. Facebook goes beyond this social media site staple by incorporating ads and apps into its primary interface. It may be unfair to compare Google+ to Facebook since the former advertises in other parts of the Google Suite (most notably in Gmail), but it is worth mentioning that there are no advertisements or sponsored stories in Google+. Also, while Google offers games to their Plus users, they do not unlock rewards or post high scores on Friends’ walls. This aspect to mediums might be the simplest and yet most overlooked of the lot. Like human memory in oral cultures or paper in typographic ones, “each medium includes material and conceptual components for the reception, accumulation, and retrieval of information.” How information is stored and retrieved has institutional considerations, and especially with social media sites there are significant design components that play considerable roles in their archival dimension. Related to the issue of accessibility and economics is the portability of mediums. When looking at spaces such as Google+ and Facebook, which can be accessed through smartphone and tablet applications, an entire realm of archival and design philosophies could be analyzed. As it is, much could be said about the archival dimensions of these sites as they are accessed on the computer. Within the technological dimension I mentioned that Google uses its fully developed email client for Google+ messages. Gmail has a geek-famous archiving system which allows you to keep thousands of emails for as long as you have the account (and a little longer). A benefit to the full integration of the Google Suite is the search capability across the platform, including email. Any keyword, contact, or subject that you have run across during your Google journeys is a Google search away. Facebook lacks a general search capability and instead archives messages and wall posts in terms of “Friendships.” Messages are stored indefinitely, organized by date and Friend, and easily accessible from the landing page. The most interesting aspect to social media archiving is the information that users interact with on the landing pages. Those Streams and News Feeds are the information hubs, away from which very few people have to navigate in order to accomplish their tasks. Google’s metaphor is more honest, but both pages are constantly being updated with new information – always running and rarely stagnant. As new information is posted older information is moved down the page until it gets relegated to the area of “Older Posts” which requires a mouse click to access (a relatively demanding act in the world of social media). Regardless of the actual value of an update both sites favor the newest information at the expense of older posts. It is important to remember the economic discussion because Facebook’s News Feed moves all the more quickly as more people “like” those sponsored ads or play the games offered. Even at the most basic level, the more Friends someone has, the more updates are being posted and the quicker the News Feed scrolls along. The News Feed in particular, but potentially Google+’s Stream as well, end up becoming transient spaces with respect to the archival dimension. Gaining more Friends and interacting with more ads is encouraged by design and those activities move the News Feed quicker – giving the user less time to notice, let along interact with, more relevant information on that landing page. Social media sites create an archival paradox where everything is at the same time ephemeral and yet indefinitely stored and always accessible. The problem is the extra work that is required to find older information, which is especially an issue with Facebook, often proves to be unjustifiably difficult. If a deterministically-oriented analysis would focus merely on the technological dimension of a medium, a visual analysis probably wouldn’t be able to say much beyond the aesthetic dimension. This aspect of a medium is comprised of “corresponding conventions and expectations for form, formatting, design, and content.” These conventions so saturate the culture in which the medium thrives that they often become a sort of synecdoche for the medium and all of its other component parts (or dimensions). That is to say that often mediums are assessed by their aesthetic component so that certain normalized conventions can instantly establish trust with the user: academic periodicals aren’t typically going to use a comical font, local news coverage looks the same around the U.S., and bogus websites rely on their aesthetic similarities to legitimate ones in order to scam viewers. This phenomenon is unique to the aesthetic dimension. From a visual standpoint, the most apparent difference between the two landing pages is the busyness of the interface or amount of space that is filled throughout the screen. As I’ve already mentioned, the extra clutter on the Facebook page is due, in large part, to the requisite advertisements but there is another significant difference that makes the Google+ page look cleaner: the absence of text. This approach not only makes for a cleaner design but it affects the user interface in significant ways. For example, it is not clear to me which interface is more daunting. While the technological components of Facebook are more clearly labeled, the cluttered nature of the landing page appears as if there is a lot that demands my attention at once. Google+ remedies that by employing clean images in place of text, but that seems to demand a different level of digital literacy and bravery: familiarity with signified meanings (though not all the images are clear signs) or the knowledge (if even accidental) required to hover over icons, and the willingness to experiment with a completely foreign design scheme. Both sites use a primarily white background with black and blue text-schemes. While there could be many explanations for the white backgrounds on both sites, given what scholars have said about social network sites being a place where users can “write themselves into being,” I can’t help but see the white background as a rhetorically constructed canvas of sorts where each user paints their identity into being with various networked choices. Relevant to this claim is earlier discussions of “Text sense” and computer composition. As Christina Haas has written, “Text sense is a mental representation of the structure and meaning of a writer’s own text. It is primarily propositional in content, but spacial and temporal aspects as well.” When writers started switching over to computers, the quality of their writing declined and they found themselves printing off bits of their texts for editing, restructuring, and generative purposes. Fixed pages in a word processor and limited viewing due to small monitors contributed to that spacial component of text sense, and it seems as if the same concern could be raised about the text box provided in social media sites. A blank page offers a writer space to create into, while every student knows what it feels like to squeeze words into the last bits of white space at the end of a page. Facebook will let you type on to the next line if your comment goes that long, but it doesn’t invite longer compositions. Google+ gives the user space to write into and, in my experience, invites longer compositions. I suggest that the larger space offers the user more text sense than Facebook’s single line does. In both cases the amount of space provided shapes expectations for the writer and the audience in significant ways. These two categories are separate in Turnley’s formulation, but they are more abstractly defined than the previous categories and they also cover aspects that are (seemingly) necessarily covered under the previous dimensions. In that way they provide opportunities for summary. The subjective dimension relates to “patterns and expectations related to subject formation, the nature of the self, and the positionality of users/audiences.” Within this dimension user action and identity construction is explored and, therefore, there is significant crossover in my discussion within the social and aesthetic dimensions. Facebook sees connectedness in terms of digitally-mediated friendships where only the shortest of conversations are publicly encouraged between the user and the audience. Google+ builds a culture of connectedness in terms of overlapping circles that relate to the user differently, and it favors longer discussions by providing a better overall text sense to the user and commenter alike. The epistemological dimension covers the “assumptions concerning the nature of knowledge, information, truth, intelligence, and literacy” which overlaps with all of the previous categories in part and specifically with the economic and archival dimensions. Both of these sites require similar but distinct levels of digital literacy to be used effectively. Likewise, both sites provide a fluid notion of knowledge and information. Facebook in particular seems to promote quick-moving information with little interaction. Despite the transient nature of information immediately available to the user, both sites archive their information under varying layers of clicks and searches. In practice Turnley only asks her students to employ a few of these dimensions at any given time – and one could easily see why: a fully utilized framework would take an unreasonable amount of time to use in most circumstances. Furthermore, there is so much overlap that certain categories could take precedent over other, more redundant dimensions. There also may be situations that are not as modally complex as social media sites are. But as online interactions increase and mediums grow more complex, our older methods of analysis aren’t going to suffice and multimodal approaches are going to have to be further developed and employed more regularly. In this case, Turnley’s version of mediology provides a helpful rubric by which multimodal rhetorical sites like Facebook and Google+ can be more fully analyzed. boyd, danah. “Friends, Friendsters, and MySpace Top 8: Writing community into being on social network Sites.” First Monday 11, no. 12 (December 2006). ________, and Nicole Ellison. “Social Network Sites: Definition, History, and Scholarship.” Journal of Computer-Mediated Communication 13 (2008), 210-30. Burbary, Ken. 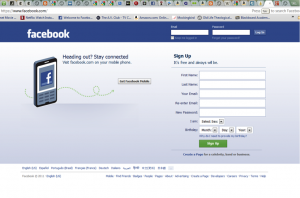 “Facebook Demographics Revisited – 2011 Statistics.” March 7, 2011. Ken Burbary. http://Retrieved from http://www.kenburbary.com/2011/03/facebook-demographics-revisited-2011-statistics-2/ (accessed December 7, 2011). Friedman, Devin. “The Viral Me.” December, 2010. GQ Magazine. http://Retrieved from http://www.gq.com/news-politics/big-issues/201012/viral-me-silicon-valley-social-networking-devin-friedman (accessed December 9, 2011). Frith, Jordan, Matt Morain, Chris Cummings, and D. Berube. “Reviews of the Books: The Shallows: What the Internet is Doing to Our Brains by Nicholas Carr and You Are Not a Gadget: A Manifesto by Jaron Lanier.” Journal of Communication 61, no. 1 (2011). “Google+ User Statistics Part II – How Have Demographics Shifted Since G+ Came Out of Beta?” August 19, 2011. http://Retrieved from http://bimeanalytics.com/blog/google-user-statistics-part-ii/ (accessed December 7, 2011). Haas, Christiana. Writing Technology: Studies on the Materiality of Literacy. Mahwah, New Jersey: Lawrence Erlbaum Associates, Inc., 1996. Kress, Gunther, and Theo Van Leeuwen. Multimodal Discourse: The Modes and Media of Contemporary Communication. London: Hodder Arnold, 2001. Lakoff, George. Metaphors We Life By. Chicago: The Chicago University Press, 1980. Martin, S. “Identity Construction on Facebook: Digital empowerment in anchored Relationships.” Computers in Human Behavior 24, no. 5 (2008), 1816-36. Palfrey, John, and Urs Gasser. Born Digital: Understanding The First Generation Of Digital Natives. New York: Basic Books, 2010. Postman, Neil. “Now… This.” In Amusing Ourselves to Death: Public Discourse in the Age of Show Business. 1985. Reprint. Reprint, New York: Penguin Books, 2006. Sweester, Kaye D., and Ruthann Weaver Lariscy. “Candidates Made Good Friends: An Analysis of Candidates’ Uses of Facebook.” International Journal of Strategic Communication 2, no. 3 (July 2008). Turnley, Melinda. “Towards a Mediological Method: A Framework for Critically Engaging Dimensions of a Medium.” Computers & Composition 28, no. 2 (2011), 126-44.
. Kaye D. Sweester, and Ruthann Weaver Lariscy, “Candidates Made Good Friends: An Analysis of Candidates’ Uses of Facebook,” International Journal of Strategic Communication 2, no. 3 (July 2008). ; Jane Mathison Fife, “Using Facebook to Teach Rhetorical Analysis,” Pedagogy 10, no. 3 (2010). Certainly there are visual components to both oral performances and text, but there primary substance is strictly verbal which makes them distinct from images (still or otherwise).
. Nancy Baym, Personal Connections in the Digital Age (Malden, MA: Polity Press, 2010), 63.
. See Gunther Kress, and Theo Van Leeuwen, Multimodal Discourse: The Modes and Media of Contemporary Communication (London: Hodder Arnold, 2001).
. Melinda Turnley, “Towards a Mediological Method: A Framework for Critically Engaging Dimensions of a Medium,” Computers & Composition 28, no. 2 (2011), 133.
. See especially Neil Postman, “Now… This,” in Amusing Ourselves to Death: Public Discourse in the Age of Show Business (1985. reprint, New York: Penguin Books, 2006).
. Turnley, “Towards a Mediological Method: A Framework for Critically Engaging Dimensions of a Medium,” 133.
. This kind of criticism has been raised against more popular technological determinists like Nicholas Carr. See Jordan Frith et al., “Reviews of the Books: The Shallows: What the Internet is Doing to Our Brains by Nicholas Carr and You Are Not a Gadget: A Manifesto by Jaron Lanier,” Journal of Communication 61, no. 1 (2011).
. danah boyd, and Nicole Ellison, “Social Network Sites: Definition, History, and Scholarship,” Journal of Computer-Mediated Communication 13 (2008), 214.
. I am using Friend in a technical sense to denote those profiled-personas that one formally connects with through these networking sites. The actual nomenclature of such connections may differ from site to site. See danah boyd, “Friends, Friendsters, and MySpace Top 8: Writing community into being on social network Sites,” First Monday 11, no. 12 (2006).
. boyd and Ellison, “Social Network Sites: Definition, History, and Scholarship,” 214. These are typically networked games that require other Friends’ assistance to progress to higher levels. Despite Facebook’s history and popularity, Google+ appears to offer a similar amount of modules – undoubtedly due to Google’s experience in the mobile world and their Android Market of games and services for smartphones and tablets.
. For statistics and excellent infographs see: “Google+ User Statistics Part II – How Have Demographics Shifted Since G+ Came Out of Beta?,” August 19, 2011, http://Retrieved from http://bimeanalytics.com/blog/google-user-statistics-part-ii/ (accessed December 7, 2011).
. Ken Burbary, “Facebook Demographics Revisited – 2011 Statistics,” March 7, 2011, Ken Burbary, http://Retrieved from http://www.kenburbary.com/2011/03/facebook-demographics-revisited-2011-statistics-2/ (accessed December 7, 2011).
. Turnley, “Towards a Mediological Method: A Framework for Critically Engaging Dimensions of a Medium,” 132.
. George Lakoff, Metaphors We Live By (Chicago: The Chicago University Press, 1980). Consider the difference between a discussion and an argument and the immediate connotation that argument takes on simply because it has been metaphorically described as “war.” You can’t win a discussion, but you can win an argument and to varying degrees. Your raise points in discussions, but you attack weak reasoning in arguments. Metaphors easily determine the way we think and act in a variety of situations.
. Some researchers are finding a general preference toward mediated relationships over face-to-face interaction. See: Sherry Turkle, Alone Together: Why We Expect More from Technology and Less from Each Other (New York: Basic Books, 2011).
. Turnley, “Towards a Mediological Method: A Framework for Critically Engaging Dimensions of a Medium,” 134. To return to Turnley’s example of oral cultures, it is easy to imagine that some cultures could favor long-winded and eloquent speeches while others could favor brevity and “plain speech.” An eloquent speech would not have much social value to the culture that prefers brevity, and vice-versa. This does not mean that one culture prefers orality over the next, but that different cultural ideals structure mediums and their recognizable value. As I’ve pointed out in previous sections, Google+ requires a higher, or at least different, level of digital literacy than Facebook which banks on accessibility.
. Devin Friedman, “The Viral Me,” December, 2010, GQ Magazine, http://Retrieved from http://www.gq.com/news-politics/big-issues/201012/viral-me-silicon-valley-social-networking-devin-friedman (accessed December 9, 2011). Occasionally a Google product (e.g., cell phone) video will show up in the “What’s Hot” section within the Stream, but unless Google is manipulating the numbers, it appears there because it has been shared by a high number of users. The screen capture wouldn’t capture my cursor, which is being held over the illuminated camera image. It is worth noting that the far right column and a version of the far left column stay fixed throughout a user’s browsing experience on Facebook. Whereas the individual pages within Google+ are even more simply designed.
. boyd, “Friends, Friendsters, and MySpace Top 8: Writing community into being on social network sites.” See also: S. Martin, “Identity Construction on Facebook: Digital empowerment in anchored Relationships,” Computers in Human Behavior 24, no. 5 (2008), 1816-36.; Baym, Personal Connections in the Digital Age. This seems like an important observation because of the aforementioned culture of each site. If Google+ attracts graduate students then that would certainly offer an easy explanation for the difference in posts, but I’ve noticed these differences among the same people using both sites regularly. I find it somewhat interesting that she has an author page on Facebook, but doesn’t seem to use it as a forum for conversation, while she is pretty active on Google+. Also I took the first screen available on her profile – there were other posts that were much more substantial, both in the initial post and the subsequent comments.
. Christiana Haas, Writing Technology: Studies on the Materiality of Literacy (Mahwah, New Jersey: Lawrence Erlbaum Associates, Inc., 1996), 118. 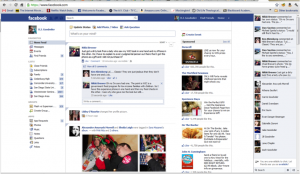 This point is further supported by Facebook’s redesigned posting interface. Until relatively recently the Enter key in a comment section would provide a line break and then the user would have to click “Post” to post the comment. They’ve since gotten rid of the “Post” button and made the Enter key post the comment (Shift+Enter now makes a line break). By increasing the difficulty involved in making a simply line break (for a new thought, for example), and decreasing the difficulty of posting quickly, they’ve shaped the nature of comments throughout Facebook and our expectations for length and substance.
. It is worth noting that the far right column and a version of the far left column stay fixed throughout a user’s browsing experience on Facebook. 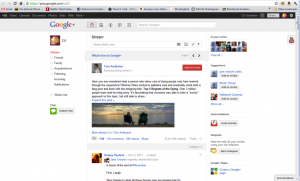 Whereas the individual pages within Google+ are even more simply designed.